Most folks aren't aware of the variety of cucumber recipes available. Instead, images of pickles or sliced cucumbers in a salad come to mind. Surprisingly, there are several recipes that feature raw and cooked cucumbers. Before we get to some of our favorite recipes, here is some cucumber nutrient information. Slice the cucumbers very thin. Place them in a colander or strainer over a bowl. Sprinkle with the salt and toss. Let stand for 15-30 minutes. The cucumbers will release much of their liquid. Transfer cucumbers to a serving bowl and add green onion, vinegar, pepper, paprika, hot sauce, lemon juice and sour cream. Stir to combine. Cover and refrigerate for at least 2 hours. Stir again just before serving. Wash and dry 2 quart sized jars and lids. Pack 3 cups of cucumbers and 2 cloves of garlic in each jar. Add 1/4 teaspoon celery seed, 2 teaspoons dill and 2 teaspoons mustard seed to each jar. In a large bowl or blender, mix together water, vinegar, salt and sugar until dissolved. Pour liquid into each jar, filling to the neck. Tighten the lids and place in refrigerator. Turn jars upside down every other day. Pickles will be ready to eat in 2 weeks. Will keep in refrigerator for several months. Cut cucumber in half lengthwise. Remove seeds and and slice thinly. In a large serving bowl, add cucumber slices, peas, Monterrey Jack cheese and cheddar cheese. In a separate bowl, whisk together mayonnaise, milk, salt, black pepper and sugar. Pour dressing over the cucumber mixture and toss to coat. Refrigerate at least 2 hours. Stir before serving. 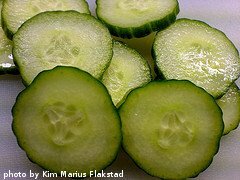 Slice cucumbers in half lengthwise and remove seeds. Chop into small pieces and place in a colander or strainer over a bowl. Sprinkle with salt and toss. Let sit 15-20 minutes. Much of the liquid will be released. Place 1/3 of the cucumbers and 1/3 of the minced garlic in a blender or food processor. Add in 1 cup of chicken stock and puree. Transfer to a large bowl. Repeat process until all cucumbers, garlic and chicken stock have been pureed together. To the cucumber puree, stir in sour cream, whipping cream, vinegar and black pepper. Whisk together until well blended. Cover and refrigerate at least 4 hours. Whisk again before serving. Garnish with almonds, onions and parsley. Cut cucumbers into 1/4 inch slices, leaving the peel on. In a mixing bowl, stir together cream cheese, salt, black pepper, garlic, roasted red bell pepper and lemon juice until well combined. Spread each cucumber slice with cream cheese mixture. Place 1 shrimp on top of each cucumber slice. Top each shrimp with a dab of cocktail sauce. Refrigerate until just before serving.